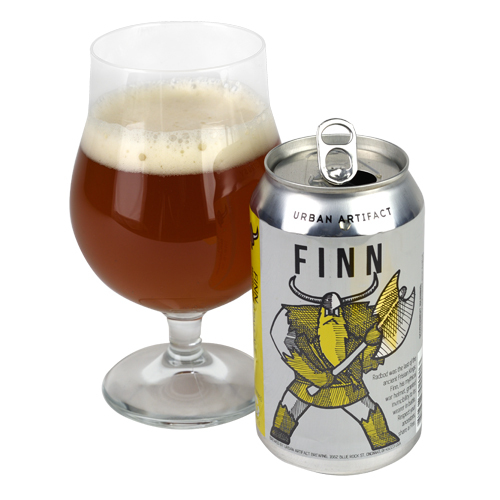 Finn is a hoppy take on a Berliner-style weisse. Learning about beer is one of the pleasures of drinking it. By reading the side of the can, I learned that Finn was the name of the helmet worn by Radbod, the ancient Frisian king. By drinking the beer I learned of a new taste discovery. Super nose! The color is spun gold with the slightest ruby tinge and a fleeting head. The beer is an elixir, a delicious cohabitation of sweet luscious malted barley, and sour, pheromone-infused Lactobacillus yeast. We enjoyed it with couscous topped with rare, fresh, Alaska sockeye salmon. The complexity of eating an earthy and spicy dish with the taste of the ocean, accompanied with Finn, makes me dream of Frisia overlooking the North Sea. It was a cold land where a leader, hot for freedom from religion, ruled with an iron helmet. Charles Finkel is founder of Merchant du Vin and the Pike Brewing Co. Finkel is a pioneer in the marketing of beers in America. OK, I’m going to admit I don’t know what to expect of a “Berliner Pale Ale.” Let’s take a peek. Aroma is beery with a mildly pleasant floral hop aroma. There’s no head on my beer, but I can get past that. Flavor is unexpected with a relatively mild and smooth sour upfront initiation. Finishes very clean, suggesting a lactic culture ferment somewhere in the process. Hop bitterness certainly peeks through the acidity, but serves to complement refreshing experience. A unique brew. Work on the beauty of head retention and this beer will belong. Nice brew! Charlie Papazian is the author of the New Complete Joy of Homebrewing, founder of the Great American Beer Festival and national beer examiner at examiner.com. Papazian is a leading voice in beer and brewing.